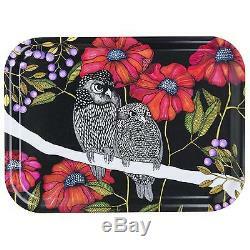 Nadja Wedin Design Angry Owls 27cm Serving Tray. 0: Sustainable laminated birchwood 1: Dishwasher proof Distressed: No Overall: 27cm W x 20cm D Design: Serving Tray Material: Wood Shape: Rectangle Finish: Black Pattern: Floral Wood Species: Birch Wood Finish: Birch. The item "Nadja Wedin Design Angry Owls 27cm Serving Tray" is in sale since Thursday, April 06, 2017. This item is in the category "Home, Furniture & DIY\Cookware, Dining & Bar\Tableware, Serving & Linen\Serving Trays".